In Playful Puppy Holly is given a lively puppy who prefers to chew, play, and explore rather than train. She takes him along to a local show where there are pet prizes are to be won. Will Holly's puppy win a prize? Children ages 5-7 beginning to learn to read will enjoy the simple sentences, word repetition, and picture dictionary boxes to help them with new words. DK Readers is a multi-level reading program guaranteed to capture children's interest while developing their reading skills and general knowledge. With nine new exciting titles to choose from this season, kid's ages 4-10 will find the perfect book at their appropriate reading level to help with school projects or independent reading. Charlotte Hicks is an author and editor of numerous titles for both children and young adults. 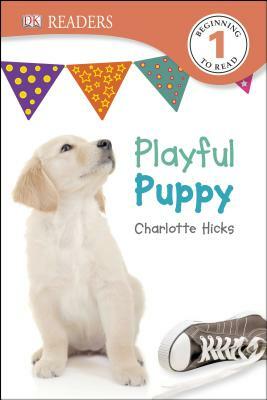 Hicks wrote the early reader's book Playful Puppy and served as chief editor for the Story Starter educational book series by Gwyneth Windsor.